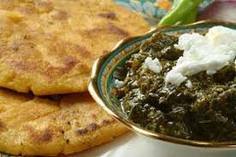 The cry of vendors on winter mornings – Methi lo, Palak lo, Saag lo, Mooli lo gives my mood an instant lift. I love anything with til in it, maroonde are my hot favorites and I can even make the ones with puffed rice. Those cries are a Chandigarh special, aren’t they? Am looking forward to the winter with a vengeance! Makki di roti with shakkar…I really love ! ohh forget desi ghee..
Green of the saag offset by White of the butter…balley balley….bruaah!!! Crisper AND tastier than that “over-done” makki di roti. The description about hemlines and sleeves changing direction is great writing and the way you have described Arjan Singh’s shop is super. Humour, subtelty and brevity are the features that describe your writing. Keep delighting us. I am guilty of not observing things when reviewing your work but you the blame goes to you. Hey Puneet! A suggestion: please change the insignia picture of your blog to something bright. The present one is drab and grey. That pic was taken this summer while travelling through one of the most hostile (yet beautiful) terrains in Himachal. Reminds me of how little we are compared to nature. I see the clear blue skies beyond the bleak foreground… But am looking for a brighter one even as I write!! You just ruined lunch for me …..
Don’t miss out on lassi. 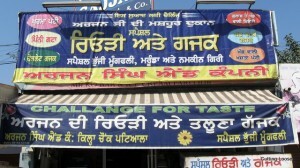 Its great health drink, even without saag-makki-di-roti. I am basically from Chd, now in B’lore since last 5 years. I miss all the things that you have mentioned in your post. I know what you mean. I was away from these delicacies myself for a decade and have now returned with a vengeance! I was fortunate to be served a load of this stuff recently in a surprise encounter at a village. It’s the ideal salivatant (if there is such a word), nourisher, indulgence, and intoxicant on a sunny winter afternoon.